Enjoy a refreshing Strawberry Vodka Slush Cocktail today! 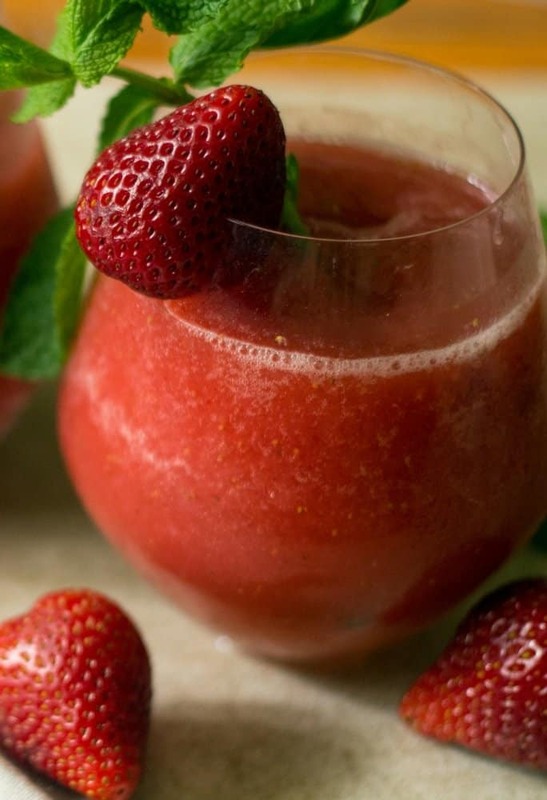 Made with fresh strawberries, this cocktail is naturally low in fat and calories! Strawberries, infused with Vodka and Triple Sec to give the adults the afternoon cocktail needed to relax and enjoy! For those who prefer a mock-tail or a kid-friendly Strawberry Slush, I have included the instructions to prepare without the alcohol. I made skinny Pineapple Mango Frozen Margaritas with Chili Salt Rim to kick off last weekend. I am seeing the theme on drinks with alcohol, unintentional, but I may need one after these last few weeks. 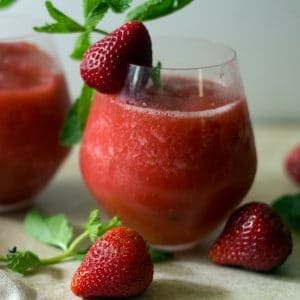 Today I bring to you the most delicious and refreshing Strawberry Vodka Slush Cocktail! I have also included instructions for a mock-tail. I’m not sure how it evolved, but I have become the family mixologist! Whether it’s a drink with alcohol or a mock-tail, I really enjoy creating drinks for my family and friends! I love adding blended fruit into my drinks! Refreshing and they keep the fat and calories down! Right now, we have strawberries at the farmers market at ridiculously low prices. Buy up the strawberries and freeze them to make this delicious strawberry vodka slush with fresh strawberries well into the Fall! I hope you enjoy this most refreshing cocktail! 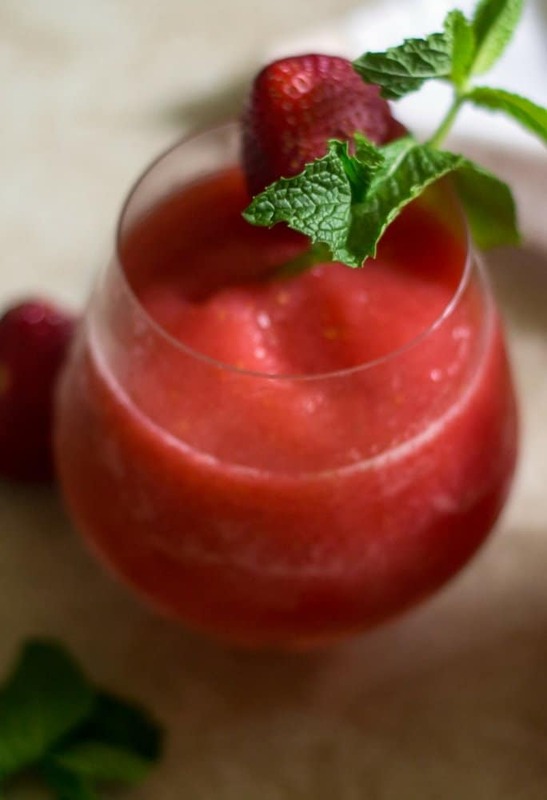 Strawberry Vodka Slush Cocktail is super easy to make, low-fat,low-calorie and always a hit with family and friends! I think it is a perfect night to make these and sit by the ocean with the hubs! Is it okay to keep vodka in the freezer? Yes, Vodka does not freeze so if you prefer cold vodka asap, keep it in the freezer. Can I use another type of alcohol to make this strawberry slush? Absolutely, gin or rum would pair well with this slush. How do you freeze whole strawberries? place the fruit, be sure they are not touching, on a cookie sheet in the freezer for about one hour. transfer to labeled freezer bags including the date. I usually freeze 1 cup per bag. A perfect way to store strawberries for pies. This post contains some affiliate links for your convenience (which means if you make a purchase after clicking a link I will earn a small commission which helps keep my blog up and running but it won’t cost you a penny more!) Click here to read my full disclosure policy. How do you puree and freeze strawberries? Puree strawberries and place them in ice-cube trays. I usually do 2 teaspoons per cube. This is a great way to add strawberries to smoothies. How do you make Strawberry Vodka Slush? In a blender, add frozen strawberries, vodka, triple sec, and ice cubes. Blend well and pour into a tall glass. I hope you enjoy this most refreshing cocktail that is super easy to make and low-fat, low-calories and always a hit at parties! Myself, I just love this on a Friday afternoon sitting by the ocean! 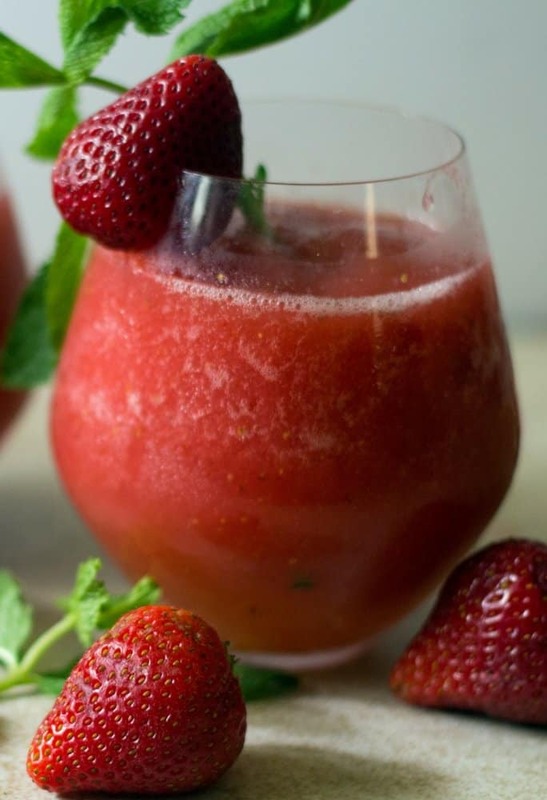 Are you loving this tasty strawberry vodka cocktail, giving it a 5-star rating and any comments are super helpful for me and very much appreciated! 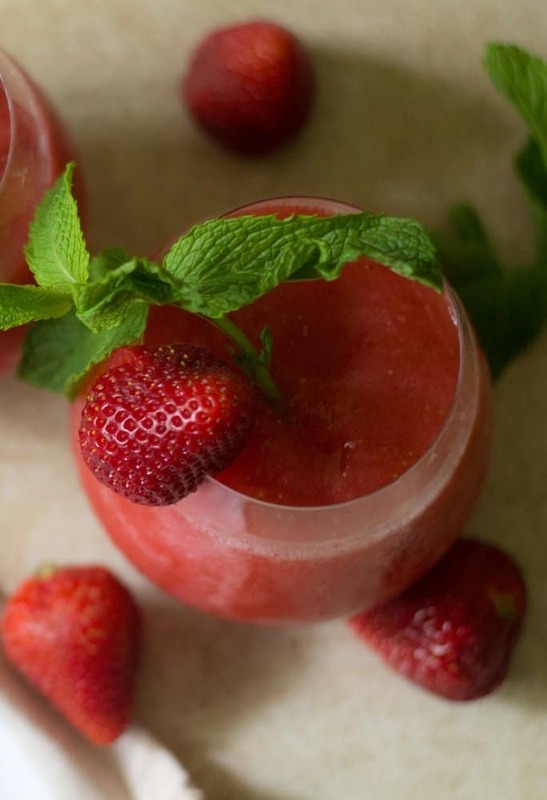 A refreshing adult slush made with lots of flavor from fresh strawberries. Add in vodka and triple sec to have an adult cocktail that is low in fat and calories. I have included instructions for a mock-tail which is perfect for those who do not prefer alcohol and great for kids because it is all natural. Add into a blender, frozen strawberries, ice cubes, vodka, and triple sec. Blend well. Optional to add a lemon soda or club soda to the strawberry slush. Sip to step 3. If a mock-tail is preferred, leave out the vodka and the triple sec. Add in another 1/2 cup of strawberries and 1/4 cup of ice. Also add 1/2 cup of lemonade, lime-aid, or pineapple juice. Blend well. I used my Simple Syrup recipe and added 2 mint stalks to the syrup once the sugar melted. Discarded the mint leaves after 1/2 hour. Follow me on Pinterest for delicious recipes! Wow, this was awesome! Made these to cheer us up and think of summer! These are great! I am so happy you and your family enjoyed. I know sometimes the winter weather needs a little summer time happiness and this delivers! That drink looks so good and I’m sure that it’s so yummy. Thanks for sharing your Strawberry Vodka Slush Cocktail recipe and tips. You are very welcome Angela! hope you enjoy! I don’t even like vodka, but this looks delicious. I haven’t had an adult beverage since last year. I need to get out of the house lol. The beauty of this recipe is that you can have a mock-tail too! I hope you get a Me day soon Missy! The mint I planted years ago is overtaking my garden. This might be a good use for it! What a beautiful cocktail. You timed the posting of the recipe at just the right time. There are plenty of strawberries at the stores — I’m putting that fruit on my grocery list. Can’t wait to make this. Aw, Thank you Marisa! I hope you enjoy! I loved your Buffalo Cauliflower, I hope you enjoy this as much as I loved your recipe! This has become my favorite poolside drink! I really love the strawberry flavor. The cub soda adds great fizz! This sounds good – I would like to make it a virgin – I bet it would be good too, I like to freeze my strawberries as well. The virgin is just as good! I have instructions for that because I add more strawberries and a bit more ice. I hope you enjoy! This is seriously a fantastic drink, and I don’t usually drink alcohol, but would gladly give this a go. You had me at strawberry! Any party would be a smashing success with a few of these beauties! Thank you Daniela! It has become my families most requested drink this summer! Wow, this looks really delicious. I cannot wait to try making this tonight. I hope you enjoy and come back and tell me how the recipe worked for you! Love the color of your drink, I freeze my fruits all the time to save for smoothies as well. OH this makes for a perfect BBQ party. I LOVE strawberries and vodka.. Sounds so refreshing and pretty. Thank you Veena! This is a favorite cocktail for me! This sounds so delicious and refreshing! Perfect summer cocktail. And I agree I don’t like mixers either and prefer to make my own. Love how colorful this is as well. Vodka is by far my favorite alcohol and strawberries are to die for! I can’t wait until this baby gets here so I can try this out! I hope you enjoy! Let me know when you make this one! This looks really good! It reminds me of a drink I had at a Mexican Cantina before. I bet its chock full of flavor. have been looking for a new drink recipe to try for my BBQ this weekend. It looks so delicious and refreshing. I will make a mocktail version for the kids. Thank you Donna! Its so refreshing and pretty! Perfect for entertaining outside. Great for the BBQ season and hot summer weather. Delicious way to use the fresh berries that are just coming into season. What a refreshing drink for this hot summer evenings?! I can just imagine sipping this while sitting on the deck, watching the sun go down. ahhh … a vacation in a glass! I agree, a vacation in a glass! We had these again this evening on our deck! Relaxing! Your photography is superb! What a great cocktail. Love when cocktails are crafted with real fruit and also seasonal flavors. This is a winner! You are too Kind Adriana! Thank you and I do love seasonal fruit and cocktails too! Strawberries are one of my favorite fruits and slush is one of my favorite forms of drinks. This looks terrific to me! Awesome Val,I hope you make and enjoy! Vodka is my favorite drink, and strawberries are perfect for summer. Your Strawberry Vodka Slush Cocktail sounds absolutely delicious! Thank you Heather! One of my favorites! Mayyyybe your cocktail theme on Free Friday is unintentional… but obviously you’ve got something subliminal going on there… 😉 Vodka is my liquor of choice when mixing drinks, and this strawberry slush looks and sounds perfect! Lol, you got me, maybe it is unintentionally intentional! This sounds so delicious! I have a bottle of vodka sitting here I need to open. This would be perfect for me! Wish I lived closer, we could have cocktails together :)! Ohh those strawberries look so yummy. This drink is perfect for this hot day.